Did you miss one of New-York Historical's recent public programs? Recordings of select programs are available here as streaming audio. 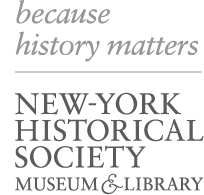 Podcasts of select programs are also available on New-York Historical’s iTunes library. These files can easily be downloaded and played on any Mac, PC or portable device and even burned to a CD. How likely is it that you are unwittingly assisting a client in money laundering or terrorist financing? It may seem far-fetched, but the U.S. legal profession is under intense pressure to embrace anti-money laundering requirements that apply to banks and other financial institutions. In an engaging conversation, the expert panel will discuss and review the Financial Action Task Force (FATF) guidance aimed at U.S. “Gatekeepers,” the legislative and regulatory efforts to impose anti-money laundering requirements on the legal profession, a new ethics opinion on Gatekeeper issues, and publications produced by legal bar associations to assist lawyers and others in detecting and preventing money laundering and to grasp when to decline or terminate representation. This program benefits lawyers, accountants, trust company service providers, foundations, and other fiduciaries. Gideon Rothschild is chair of Moses & Singer’s Trusts and Estates and Asset Protection practices. Barbara Sloan is a partner at McLaughlin & Stern. Jack Terrill is a partner at Heckscher, Teillon, Terrill & Sager, P.C. Moses & Singer LLP has been certified by the New York State Continuing Legal Education Board as an Accredited Provider of continuing legal education. This CLE program is both transactional and non-transactional: it is appropriate for both newly admitted and experienced attorneys admitted to practice in New York State. 1.5 CLE ethics credits will be awarded for the 90-minute program. Historian Timothy Snyder explores the historical context of the contemporary shifts in the balances of power between the United States, Europe, Russia, and China. Author Nick Bunker, in conversation with historian Carol Berkin, explores Benjamin Franklin’s early life as a complex, driven young man who would go on to become the archetype of American ingenuity. Historians delve into the life of one of the leading writers, orators, and abolitionists of the 19th century: Frederick Douglass. Acclaimed Civil War scholars discuss and debate the military, political, humanitarian, and historical perspectives of a pivotal Civil War conflict: the 1862 Battle of Antietam.